Miley Cyrus reunited with her childhood best friend Lesley Patterson at her Younger Now album release and "Welcome Home" party, hosted by Spotify, at Tootsie's Orchid Lounge in their hometown of Nashville, Tennessee on Friday. 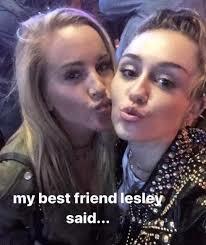 "My best friend Lesley said 'Oh she's just being Miley' !!!! sooooo glad my bestie since I was a littttttle BB made it to my #spotifyfansfirst #YoungerNow release party! Life is sooooo full circle !" Miley wrote on Instagram, alongside a couple of pics of the two. "I think our face says it all!! Loved seeing my girl kill it tonight and I couldn't be more proud! #YoungerNow release party," Lesley wrote on Instagram, alongside her own pic of the two. A History of Miley Cyrus' BFFs: Whatever Happened to Cheyne, Mandy and Lesley? Miley mentions Lesley's name in her 2007 debut single "See You Again," which is featured on the second Hannah Montana series soundtrack album. The full lyric goes, "My best friend Lesley said, 'Oh she's just being Miley.'" Lesley still lives in Nashville and occasionally tweets birthday greetings and throwback posts at Cyrus. Both Miley and her dad Billy Ray Cyrus performed at the party, which her mom Tish Cyrus also attended. Younger Now was released on Frday and contains the singles "Malibu"—Mikey's ode to fiancé Liam Hemsworth, "Younger Now," "Inspired" and "Week Without You," the latter of which dropped last week and is about relationship struggles.